Maintaining water and food security across the Indo-Gangetic Plains of South Asia presents considerable challenges to a region that hosts 40 per cent of the world’s population. 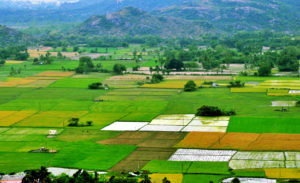 In northern India, irrigation practices for the rice-wheat cropping system continue to ‘draw down’ on the region’s limited groundwater reserves. Ground water is dropping at a rate of up to 10 cm per year across the Indo-Gangetic Plains of northern India and neighbouring countries. This represents a major threat to both water and food security in the region. Poor irrigation practices combined with subsoil constraints in some regions of Haryana, present serious challenges to the majority of farmers who struggle to maintain their livelihoods on small, intensively farmed landholdings. Current extension services provided to farmers are largely ‘top down’, with extension officers having a poor understanding (and skill level) of participatory extension approaches. Often, they fail to engage confidently with farmers in a manner that leads to practice change. Further to this, there is under-representation of young agricultural graduates (particularly women) in providing irrigation management services to farmers, both in the public and private arena. 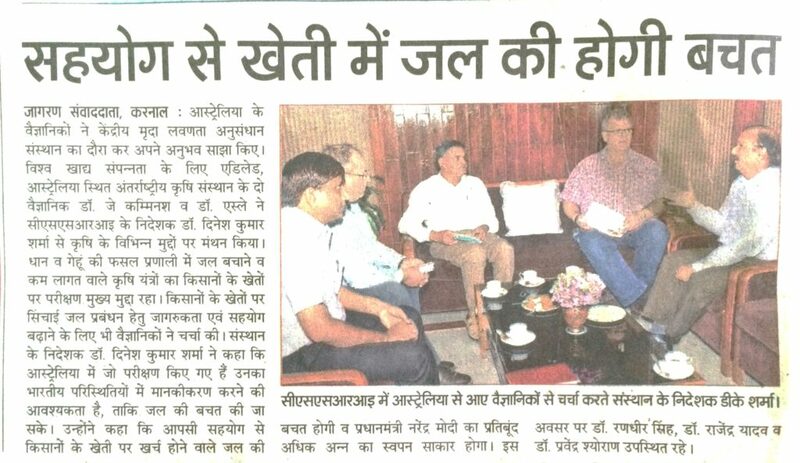 In response to these challenges, some thirty-one agricultural extension specialists from northern and eastern India and Nepal recently participated in a one week training program titled ‘Participatory Irrigation Management for maintaining regional food and water security in northern India’. The program was funded through the Crawford Fund, the Australian Water Partnerships Program and International Agriculture for Development (IAFD). The training was jointly hosted by the Central Soil Salinity Research Institute (CSSRI) and the International Maize and Wheat Improvement Center—CIMMYT—and participants were actively engaged in planning for and delivering a series of local farmer field activities, which focused on improving irrigation and water management practices in wheat crops. The IAFD team discussed opportunities for undertaking collaborative extension outreach training and demonstration programs focusing on irrigation management. L to R: Dr Randhir Singh, CSSRI, Ashley Lipman IAFD, Dr RK Yadav CSSRI, Dr Jay Cummins IAFD, and Dr DK Sharma, Project Director, CSSRI. Prior to the farm visits, participants learnt about the role of Australian soil moisture monitoring tools to assist in irrigation scheduling. These tools offer the potential for achieving 20 to 30 per cent in water savings, based on current farmer irrigation practices. Participants received ‘hands-on’ training in conducting soil description assessments in the field, in addition to updates on applied research in crop water use and regional hydrological challenges. For many participants it was their first experience at planning and being involved in the delivery of practical field-based training. Feedback from participants confirmed the need to provide more practical and applied training. You can view a slideshow of the training participants below, or on our YouTube site. According to local Haryana farmer Vikas Chaudhary, if change is to occur at the farmer field level, farmers needed to be engaged on an equal footing as partners in on-farm demonstrations. Vikas has been responsible for leading a major on-farm participatory demonstration program on his farm, which has successfully engaged with many of his local village’s younger farming community.